Marvel's Avengers are back in the new, feature-length animated adventure Avengers Confidential: Black Widow & Punisher, available March 25 on Blu-ray Combo Pack, DVD and Digital from Sony Pictures Home Entertainment. 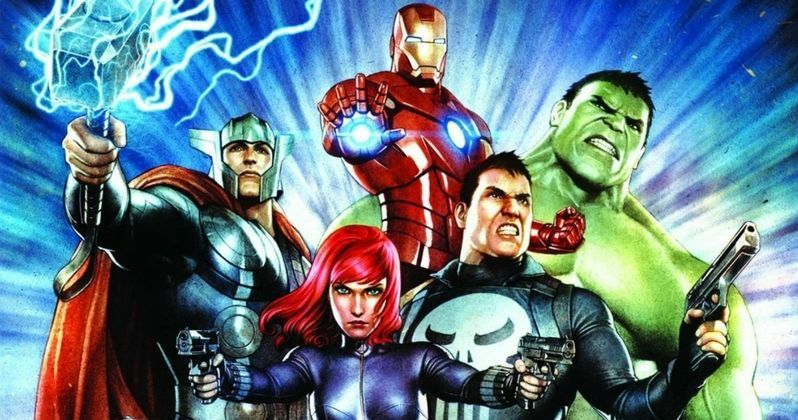 In this action-packed animated film, two of Marvel's most popular characters, Black Widow (voiced by Jennifer Carpenter, TV's Dexter) and the Punisher (voiced by Brian Bloom, Call of Duty: Modern Warfare 3) team up alongside Iron Man, Thor, Hulk, and the rest of the Avengers. You can check out these characters in action with the first trailer and photo, along with the Blu-ray and DVD cover art. Go behind-the-scenes of Avengers Confidential: Black Widow & Punisher with two revealing, making-of featurettes "Espionage and Punishment" and "The Vigilante Vs. The Spy." In both featurettes, fans will hear from filmmakers on the highly anticipated pairing of two of Marvel's most deadly Super Heroes. The Blu-ray Combo Pack includes a special Conceptual Art Gallery offering fans an expanded view of the imaginative design. Avengers Confidential: Black Widow & Punisher was directed by Kenichi Shimizu, with a story by Marjorie Liu and screenplay by Mitsutaka Hirota. It was produced by Marvel, Sony Pictures Entertainment (Japan) Inc. and Madhouse Inc. The film has a run time of approximately 83 minutes and is rated PG-13 for sequences of action violence. "Espionage and Punishment" featurette -- This featurette looks at the exciting versions of these popular Marvel characters as adapted in this stunning style of anime. From early concept art and storyboards to the final film, all aspects of creating the compelling story of this unique anime feature are explored. - "The Vigilante Vs. The Spy" featurette - A look at the Marvel's Frank Castle (The Punisher) and Natasha Romanoff (Black Widow). Each of these characters feature dark and complex origins that led them to extreme action and extraordinary lives.